Forklift Exhaust Safety - Ino-Tek Inc. Exhaust from forklifts with internal combustion engines can expose workers to unsafe levels of carbon monoxide (CO) and nitrogen dioxide (NO2). Forklifts fueled hydrocarbon fuels are used in many workplaces. The operation of combustion engine powered fork trucks can create hazards in a warehouse or another indoor location where they operate. The fumes from the exhaust can accumulate in the working space. Improper or inadequate forklift maintenance can increase these hazards. 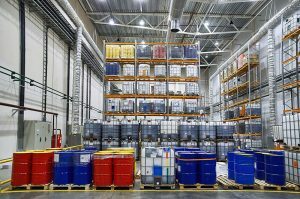 A Hazardous Material Emergency Alarm System / Gas Detection System is required for many locations where internal combustion engines are operated indoors. Ventilation is key and with immediate detection of carbon monoxide or nitrogen dioxide, the Hazardous Material Emergency Alarm System can immediately increase the fan speed to vacate the dangerous exhaust. One interesting aspect of using a Hazardous Material Emergency Alarm System is to reduce the amount of ventilation required in climates where interior air must be heated or cooled – usually at great expense. While some facilities attempt to avoid installing a Hazardous Material Emergency Alarm System / Gas Detection System by increasing the continuous flow of air throughout the facility, the added utility expense of heating or cooling and then expelling that air adds significant operating expense to the facility. One alternative approach – and the green approach – is to us the Hazardous Material Emergency Alarm System / Gas Detection System to monitor and control ventilation – increasing air turnover only when fumes containing dangerous levels of carbon monoxide or nitrogen dioxide are detected. A Hazardous Material Emergency Alarm System / Gas Detection System can actually reduce operating expense! Many facilities have made the switch to electric forklifts. A recent study indicated that “smart forklifts” - using significant computer memory and a link to facility data sources to determine where materials are stored, plus multiple sensors to determine locations, avoid people and obstacles – these smart machines will accelerate a trend away from internal combustion-powered forklifts. The ability to load and unload pallets without an operator will reduce operating cost in the warehouse of the future by a significant amount. While toxic gas emissions from carbon monoxide and nitrogen dioxide will decline, extensive use of battery charging stations will increase the creation of hydrogen gas (H2) - an extremely flammable substance – as well as hydrogen sulfide (H2S) – another toxic material. Because these hazards are different, they require different solutions. The Hazardous Material Emergency Alarm System / Gas Detection System must be reconfigured to detect these new threats. Ino-Tek focuses on the design and maintenance of Code-Compliant Gas Detection and Life Safety / Hazardous Material Emergency Alarm Systems. With over 2000 installed systems, our experts can design a cost-effective turn-key solution for your facility that may even help reduce your heating and air conditioning expenses. Need help or have a question about forklift emissions and Life Safety? Contact Ino-Tek today.